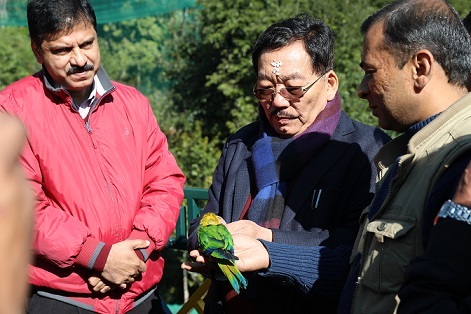 Sikkim chief minister Pawan Chamling inaugurated the Sidkeong Tuluk Bird Park at Rabdentse on Monday. The Bird Park consists of birds like Golden Pheasant, Reeves Pheasant, Silver Pheasant, Lady Amherst Pheasant, Silver Golden Pheasant, Yellow Pheasant, Jindaya Conure, Indian Fantail Pigeon and Love Birds. In a brief interaction with the forest officials and media personals chief minister declared that the park’s area would be extended from two hectares to 18 hectares and assured to release the bill amount in next budget session. In addition, he advised the forest officials to add the local species of birds like Danphe, Monal, Kaliz etc. in the park.